What is six inches long, gives you unbridled performance and you wouldn’t mind dipping in your foam? It is an espresso thermometer! These thermometers are of course quite useful for all things temperature related, since an espresso thermometer is still technically a thermometer. 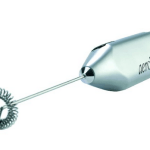 Most importantly, they are designed for measuring the temperature of your all important foam. These thermometers can also be used for latte and making sure that water temperature is right as well. 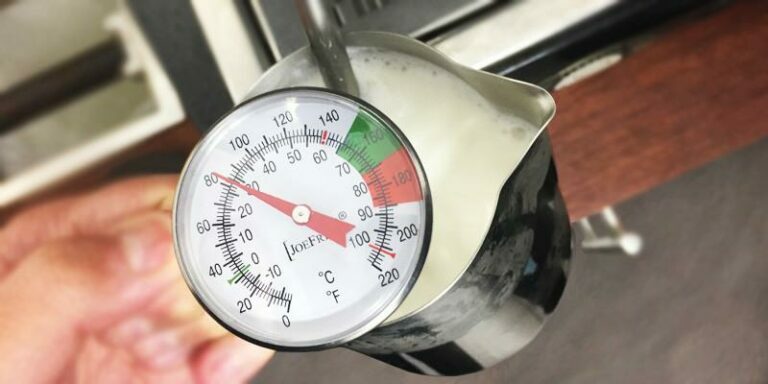 People also find other uses for their espresso thermometer, including cheese making, beer making and making yogurt. Espresso thermometers have been designed especially for measuring the heat of milk and should fit snugly inside your frothing pitcher. Some people insist they do not need them then proceed to give themselves third degree burns by attempting to check the temperature of the milk by hand. You can avoid the unnecessary skin grafts by a simple purchase of the humble espresso thermometer. It will also ensure your foam or latte is never too hot or cold again. Why is an espresso thermometer so important? Should you buy an analog or a digital thermometer? How to calibrate an espresso thermometer in boiling water? 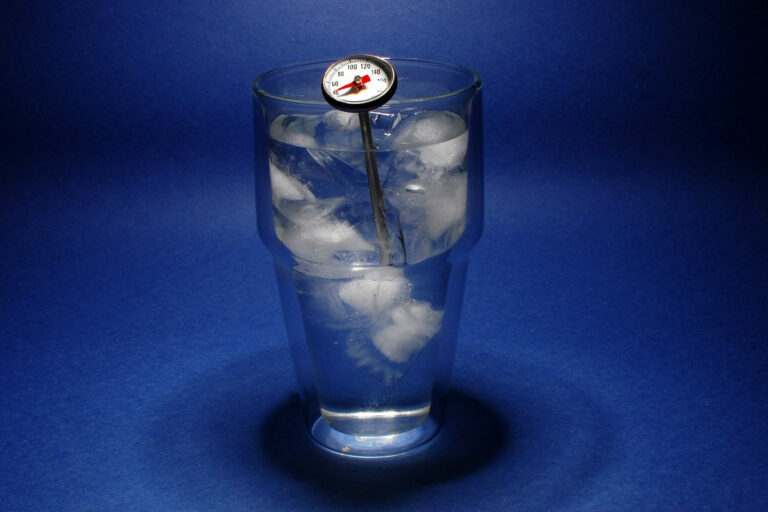 How to calibrate an espresso thermometer in ice? 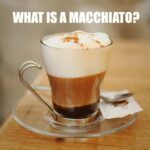 Let’s explain what why espresso thermometers matter. Have you ever wondered why your coffee is steaming hot one day and barely warm the next? Or why the same barista at your favorite cafe makes a rich full bodied coffee one time and the next time it is watery and tasteless? Brewing a perfect cup of coffee is an exercise of consistency and precision, this why an espresso thermometer is a the necessary item for any true barista. Some baristas tend to use their sense of touch and sound to determine when a pitcher of milk has reached the optimal heat. Although these skills are incredibly useful, this opens the room to inconsistency. When making and serving coffee it is crucial you make and serve a consistent product each time. A thermometer will help you make a consistent cup of coffee, day after day. A thermometer lets you know exactly what the temperature of water is and when your milk is at the best temperature for consumption. When heating milk you should know that milk can react to temperatures. Milk has a lower boiling temperature than water. When milk boils, the heat destroys its natural sweetness and introduces undesirable taste. This is why you should not overheat milk when making a cup of espresso. 60℃ (140℉) – 70℃ (160℉) – This is the optimal drinking temperature. Avoid stretching or texturing at these temperatures. 70℃ (160℉) – 80℃ (180℉) These temperatures are reserved for those that like their cups ‘extra-hot’. You should avoid exceeding 80℃ as this is close to milk’s boiling point. When preparing a perfect cup of coffee, the use of a thermometer allows for much greater precision and consistency than your sense of touch can allow. This is why any true coffee enthusiast should have one next to its coffee machine. Next we discuss what type of thermometer you should get. If you are looking to buy an espresso thermometer you are probably asking yourself the same question like many other coffee lovers; should I buy an analogue or a digital one? Digital thermometers usually have large, easy to read displays that can be read even in low light. This is incredibly useful when doing multiple things in the kitchen. For example, you can have a quick look at your thermometer from a few feet away while making a breakfast. High quality thermometers have features that can make your life easier, such as a beep alarm when your milk or water has reached a preset temperature. Digital thermometers are usually more difficult to calibrate while some models can’t be calibrated at all. They require batteries that can go flat at anytime. The last thing you want to do in the middle of your coffee brewing process is go and look for a pair of fresh batteries for your thermometer. When malfunction, digital thermometers do so with a far greater degree of inaccuracy than their analogue counterparts. Analogue thermometers use old-fashioned mechanical mechanisms which some people prefer because they look more interesting than displays on digital thermometers. As they don’t have any electronic components they are very easy to calibrate. They also don’t require batteries to work. Analogue thermometers tend to have small dial displays that can be really difficult to read from a distance or in low light. They lack additional features such as a beep alarm to let you know your milk or water has reached specific temperature. There you go! By now you should have a fairly good grasp of the pros and cons of these two types of thermometers. In reality, as long you buy a decent quality thermometer that accurately reads the temperature, it comes down to your personal preference. Stay with us as we bring you The Top 3 espresso thermometers you can buy in 2019. In pretty red and very pleasing to the eye, this certainly looks stylish. But does it work properly? With the majority of customers who gave feedback giving this five stars, it would certainly seem to! The clip makes this practical and it fits easily to pretty much most types of frothing pitcher. Some have mentioned that the dial is slightly small to read, but most people do not flag this up as being problematic. Other good points include a shaded in red area on the dial to show when the milk is in the correct temperature zone. The only mild niggle is that it may steam up a little bit. This is hardly a major concern though. 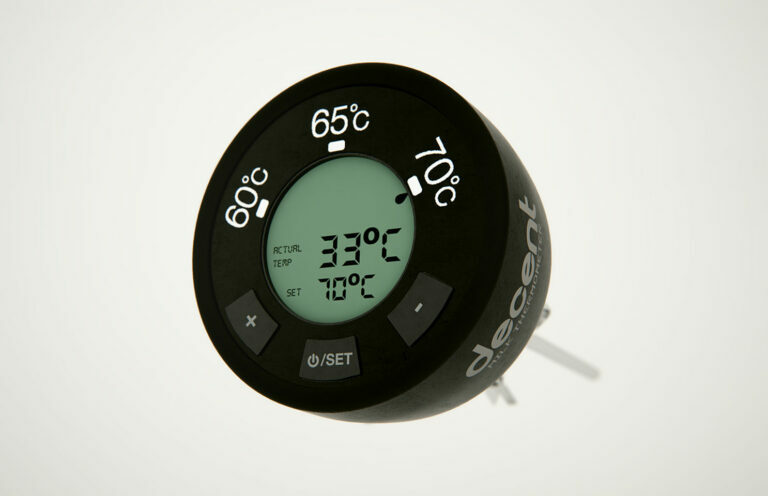 It records temperature accurately and this is all you could really wish for in an espresso thermometer! This has a nice big dial which makes it easy for just glancing at the face of it and seeing instantly where you’re at with your milk frothing. Also, it helpfully has two areas on the dial to show when the milk is at its ideal temperature and when it is into burn territory. There is also a part on the face that lets you know where your ideal starting milk should be at (around 35F). It locks down nicely on the frothing pitcher and gauges the temperature of the milk speedily and accurately. The only slight moans are that the dial is pretty large and sometimes can obstruct the frothing wand a tad, although it’s not enough to cause a serious problem really. 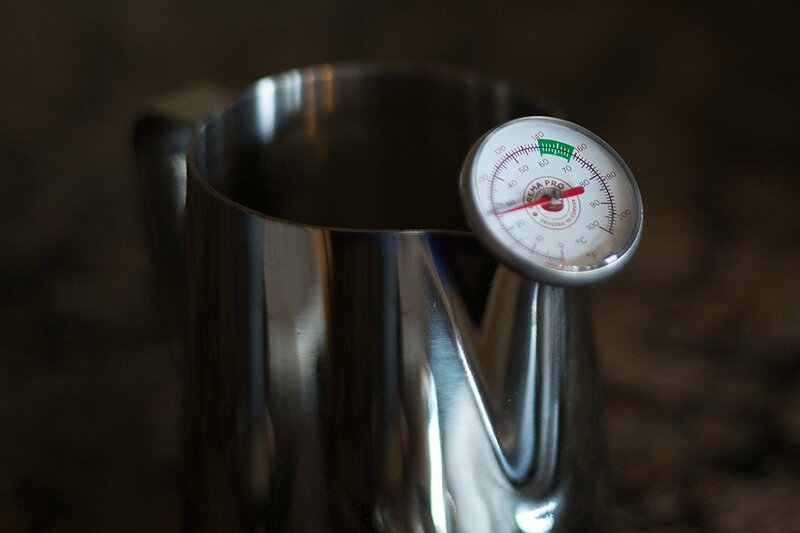 This has a slightly larger temperature gauge range than the Norpro, meaning you can check your milk is cold enough to give the best results with, giving it the slight edge, we feel. All in all, there aren’t too many reasons not to commend this as an espresso thermometer! 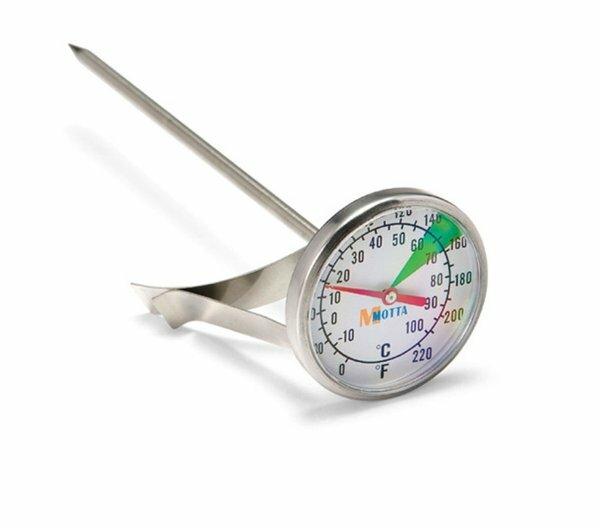 The only one of our trio of espresso thermometers to actually go from zero to 220 degrees Fahrenheit and comes from Cooper-Atkins, a manufacturer who specialize in making, amongst other things, thermometers. So hopefully this little beauty should be top notch. Things that people like about it are its large printed numbers, which make it very easy to see where the milk is at and, as previously mentioned, this measures from zero Fahrenheit, which means it can be used for testing the temperature of very cold things and not solely used for frothing or steaming milk with. The major problem with this model is it reportedly quite slow to gauge the correct temperature of the frothed milk. This can result in the temperature of the milk actually being some degrees higher than the temperature as it is read. Not an unheard of complaint with espresso thermometers in general and something that the wannabe barista needs to keep a sharp eye open for. Out of the three models, it is up to you which you plump for. They are all around the same price and all do pretty much the same thing. The Cooper-Atkins is the only one that goes from zero degrees, but you may have to learn to stop frothing 5-10 degrees sooner than the dial actually tells you to. Update International is a happy compromise with a dial going from 30 degrees Fahrenheit – ideal if you want to check the temperature of your milk before starting. And finally the Norpro is the one with the most five star ratings, but the dial only starts at 60 degrees, however this is absolutely fine for the task in hand which is frothing milk. 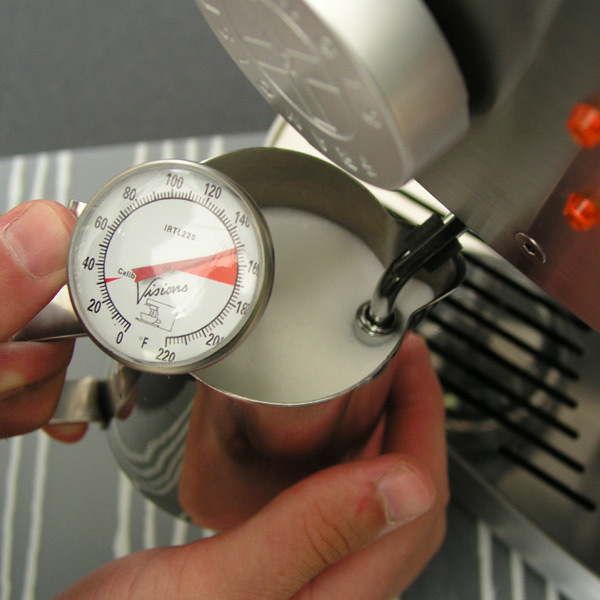 Next, we bring you a guide on how to calibrate an espresso thermometer in boiling water. Ok! You’ve bought your first thermometer. What should you do next!? The first thing you need to do after buying a thermometer is to calibrate it. Whether it is for home or commercial use it is important you regularly check and calibrate your thermometer to ensure temperature accuracy and precise readings. Dip it in some boiling water, then using some pliers, gently rotate until the temperature registers the correct number for boiling water. You could also use ice and set it accordingly if you wish. The nut or bolt in question is usually at the bottom of the thermometer. 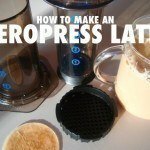 You are now ready to start making barista-quality espressos! Here is another method you can calibrate your thermometer. Make sure your thermometer robe is not in contact with the container as this might affect the readings. If your thermometer reads anything between 1-5℃ adjust it to 0℃. Now repeat the steps 3 and 4 and check whether your thermometer is reading 0℃. If it is reading 0℃ your thermometer has been successfully calibrated. 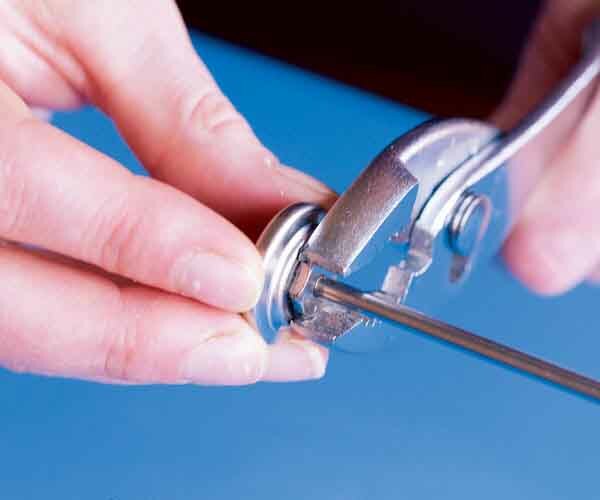 Thermometers that are found to be inaccurate should be either manually adjusted or serviced by a professional.